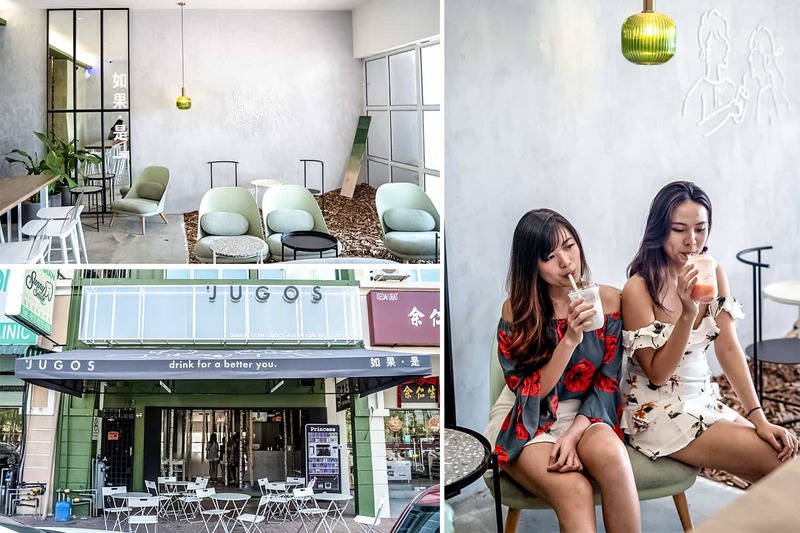 Mention ‘Johor Bahru’ to any Singaporean and you’ll probably be bombarded by discussions of the best cafes and which has the best Insta-worthy spots. 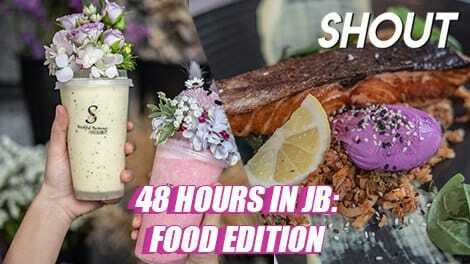 Thanks to the exchange rate, we can feast like kings in JB for the same amount that you pay for a simple brunch at an one of those overpriced cafes in Singapore. Most people make day trips over the border, but the only way to really enjoy all that JB has to offer is stay over one night as you can take your time hitting all the good cafes. 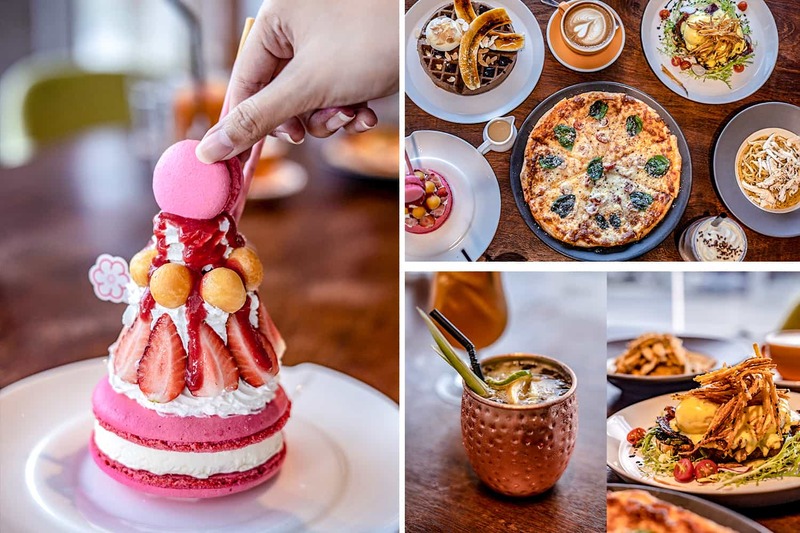 We ate our way through the plethora of cafes in JB and these are the places worth visiting to feed your stomachs and your cameras without emptying your wallets in just 48 hours. We actually did it, so this itinerary is tried and tested! If you’re heading to JB for cafe-hopping, the best way to get around is through a private car hire. Tazby Van Rental’s driver picked us all up from Marsiling MRT station and drove us all the way across the border and to our hotel, without have to battle the crowds at immigration. Taking a private car certainly beats taking the train or even the coach as you don’t have to carry all your barang with you. And if we felt like making a detour, all we had to do was ask our driver. 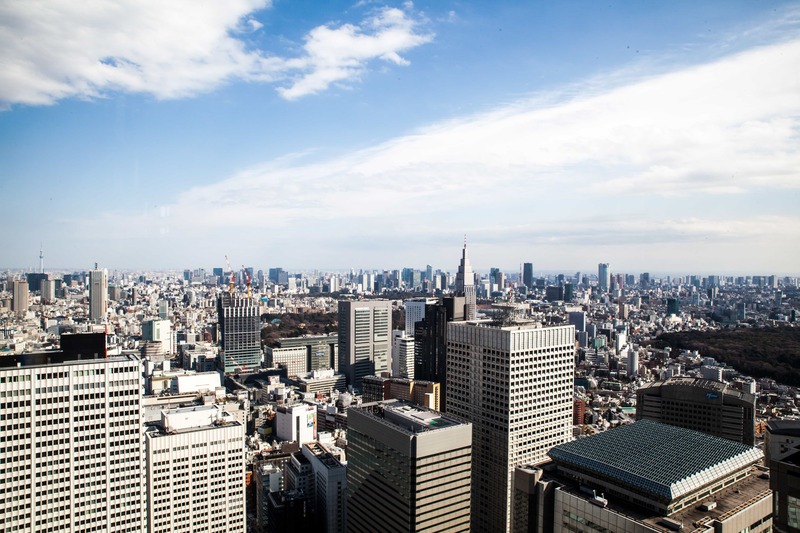 Some cafes are also located in more isolated areas, which makes calling a cab tough. 2 day rental including a chauffeur with a pickup and dropoff at one location in Singapore for 5 seater car is SG$370, for 7 seater car is SG$420, and for 11 seater car is SG$550. Cars available for rent include Perodua Axia, Proton Exora, Honda BRV, Toyota Innova, Toyota Hiace, and Hyundai Starex. After making your way through immigration, you’re probably starving. Right next to the immigration is Jalan Dhoby, a vibrant street chock full of old cafes and a trendy container park with even more eateries. Begin your 48-hour foodie experience with cheap and good indian food. 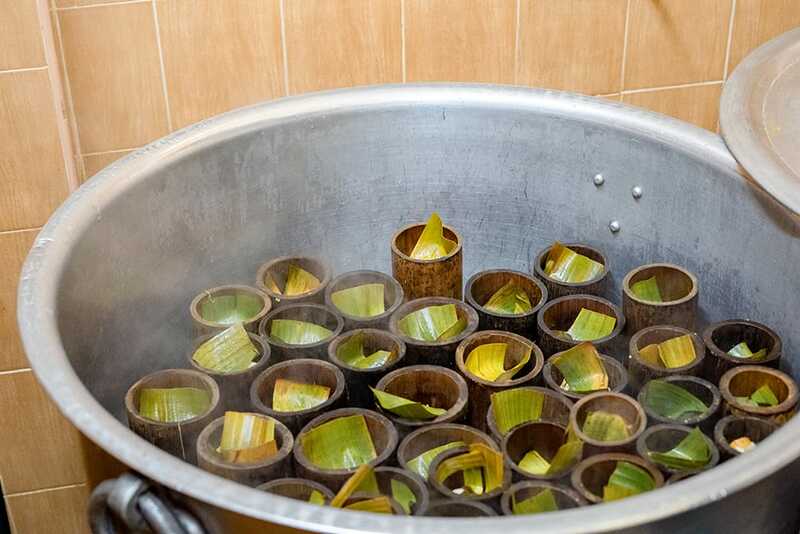 Bamboo Biryani steams basmati rice together with toppings like chicken and prawns in bamboo containers to marry the spices and the flavours of the meats together for a fragrant biryani, hence their namesake. The chicken biryani is a safe choice, with tender chicken that breaks apart without much effort on a heaping mountain of rice that’ll fill you right up. Every biryani comes with unlimited servings of raitha, a tangy onion and carrot curd, a veggie side (it was curried ladyfinger when we visited) and a crisp piece of papadum. 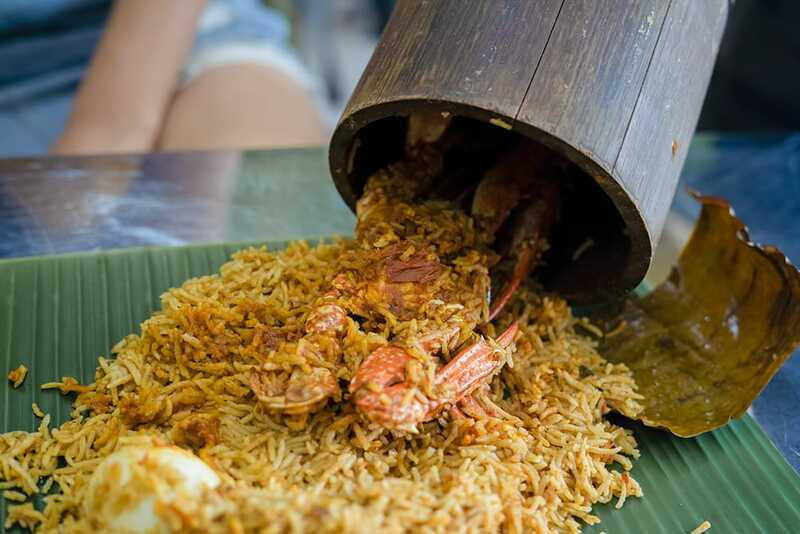 While a simple briyani with egg costs just 8RM, we felt that the crab biryani was the most value-for-money. For just 25RM (SG$9), you get an entire crab as your meat. While the crab isn’t huge, the sweet flesh was enough to satisfy our seafood cravings. Other toppings include fish, prawn, mutton, vege, and jeera. Wash everything down with a cup of masalaki, a flavourful tea brewed with cinnamon and spices. After lunch, stop by the famous bakeries just down the street for some snacks. 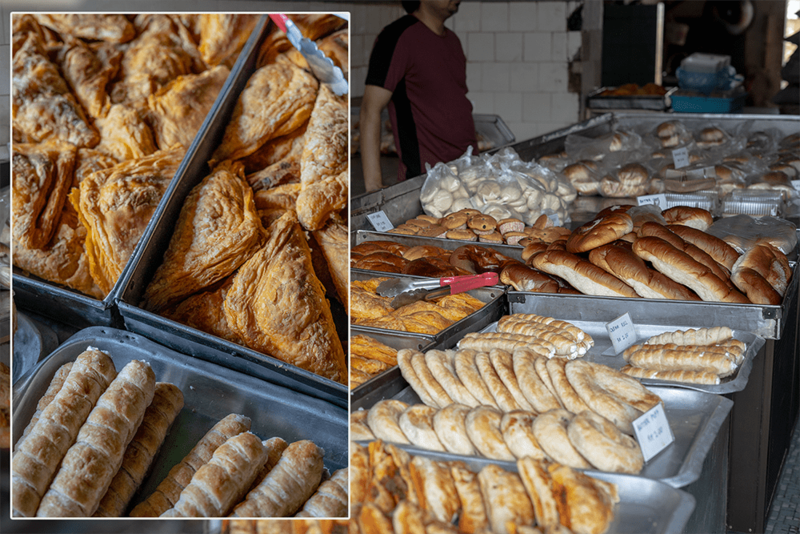 Hiap Seng Bakery is famous for their moist banana cake that Singaporeans buy by the dozens to bring back, and Salahuddin Bakery has been perfecting their curry puff and bread recipes for nearly 80 years now. Bamboo Biryani. 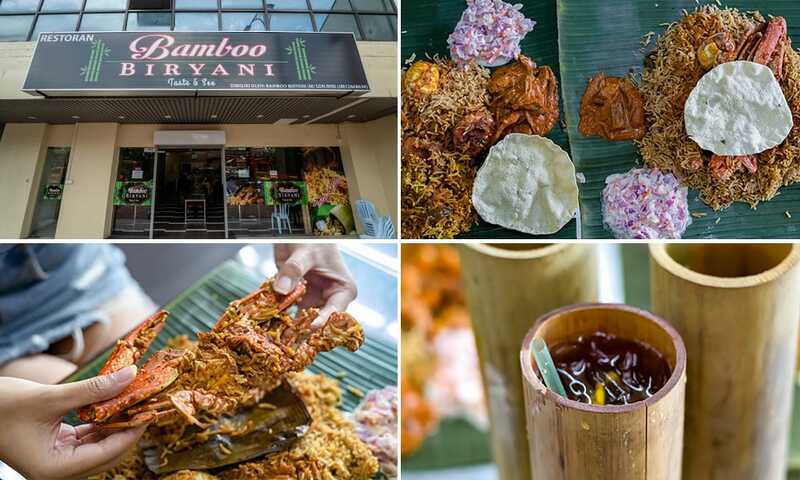 61 Jalan Ibrahim, Bandar Johor Bahru, 80000 Johor, Malaysia. 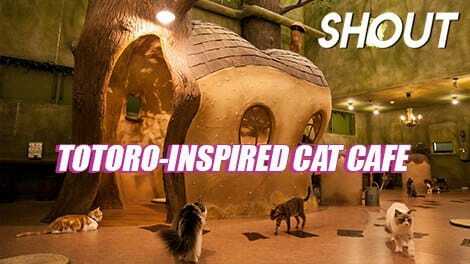 Open daily from 11am to 7.30pm. Hiap Joo Bakery. 13 Jalan Tan Hiok Nee, Bandar Johor Bahru, 80000 Johor, Malaysia. Open from 7.30am to 5.30pm on Mon to Sat, and from 8.30am to 12.30pm on Sun. Salahuddin Bakery. 26 Jalan Dhoby, Bandar Johor Bahru, 80000 Johor, Malaysia. Open from 8am to 2pm on Mon to Wed, from 9:30am – 5:30pm and 6:30pm – 7:30pm on Thu to Sat, and form 8am to 2pm on Sun. After lunch, check into Holiday Villa Johor Bahru City Centre, which is strategically located about 10 minutes away from the immigration checkpoint. Holiday Villa has everything you could possibly need or want for a quick staycation – a rooftop bar, an infinity pool with panoramic views, and even a gym for those exercise buffs who do not seem to have a rest day. With deluxe rooms starting from $113 a night, Holiday Villa is very conveniently situated just across the road from KSL City Mall, a shopping haven and also where you can find cheap massage parlours and manicurists. Just a short drive away by car, you can easily reach places like Mount Austin Heights, Taman Pelangi, and even the Austin Heights Water & Adventure Park within 15 minutes. 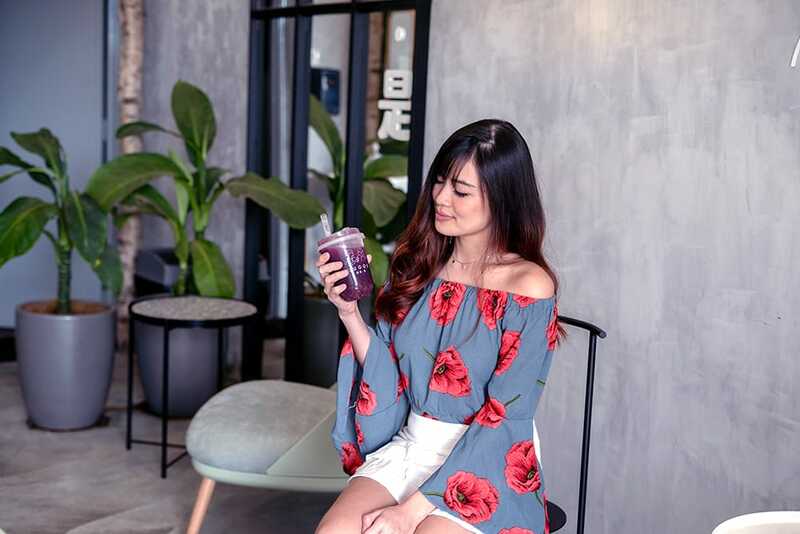 If you’re not feeling like retail therapy, there are a variety of restaurants, juice bars, and even a bubble tea joint within the same building as Holiday Villa itself so you don’t have to venture out too far. We found this cosy juice bar in the basement, which sells freshly pressed juices and milkshakes that come in gorgeous cups that look like you’re holding a mini-bouquet of flowers. 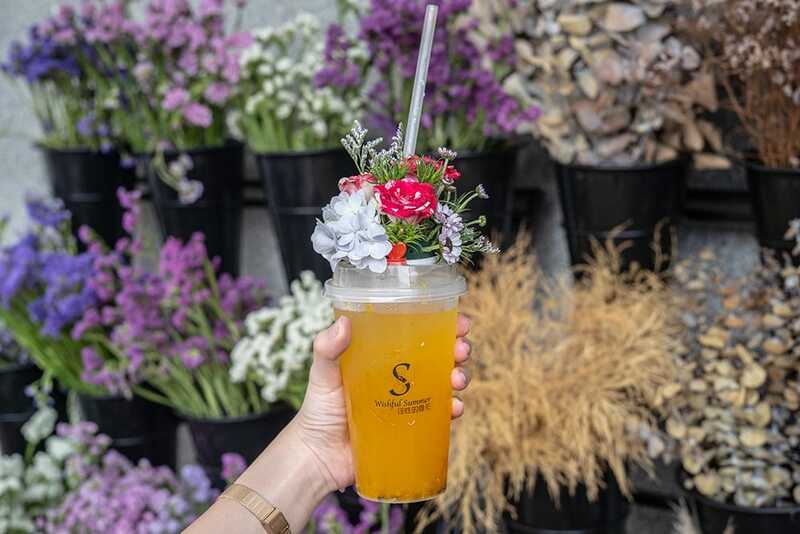 Wishful Summer has partnered up with florist Ace Flora for these pretty cups of juices that come topped with a mini-garden arrangement. It can be tricky to find Wishful Summer as it’s inconspicuously hidden under the corner of the building. From the lobby of Holiday Villa, head out and turn right down the flight of stairs. Round the corner and you should be able to see the juice bar on your right. There is an outside seating area with flower arrangements on display. While they are for sale, feel free to use them as a backdrop for your Insta-photos! Holiday Villa Johor Bahru City Centre. Menara Malpakat, 260 Jalan Dato Sulaiman, Taman Abad, 80250 Johor, Malaysia. Book your rooms online now. Wishful Summer. Holiday Villa Basement, 80250 Johor, Malaysia. Open from 12 noon to 8pm on Tues, Wed, Thurs, and Sun, and from 12 noon to 10pm on Fri and Sat. Closed on Mon. 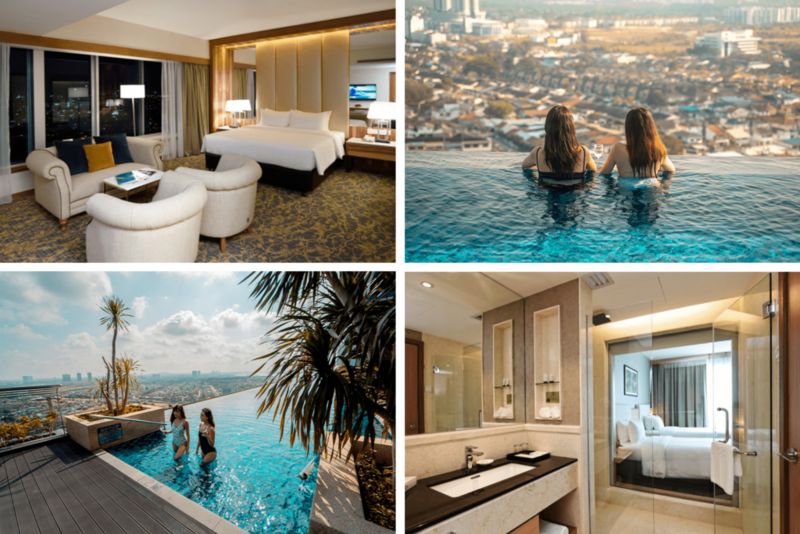 Take some time to relax in the hotel at the infinity pool in Holiday Villa, before heading up to SKY 26, the rooftop bar on the 26th floor. 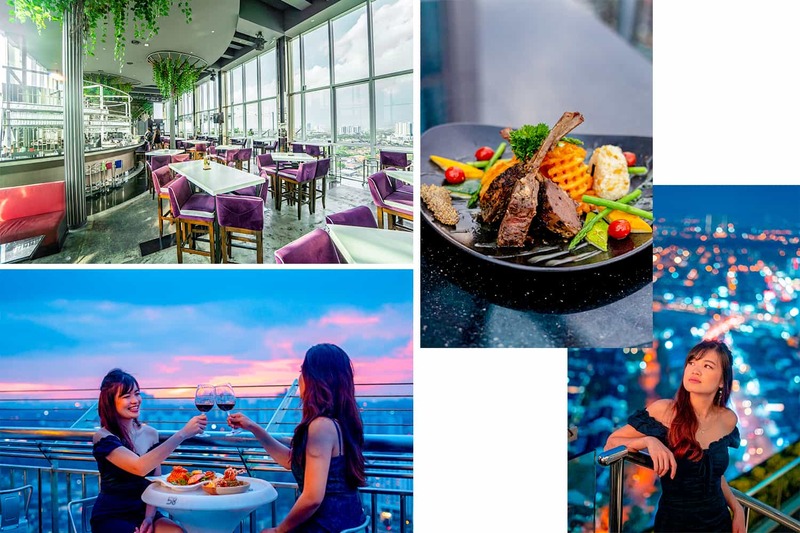 Glam it up a little by taking your dreamy OOTDs with panoramic views of the city. Those city lights sparkling in the distance? Great for inspirational captions! To soak in the golden hour as the sun sets, aim to get to SKY 26 by 6pm to get the best seats overlooking JB. Indulge in New Zealand lamb racks and salmon fillets as you crack open a bottle of French wine.SKY 26 has curated their wines for all sorts of taste palates. The Francs Les Cerisiers is a full-bodied wine with a stronger blackberry taste best paired with red meats, or go for the Chateau Bolaire, a lighter and fruitier red. 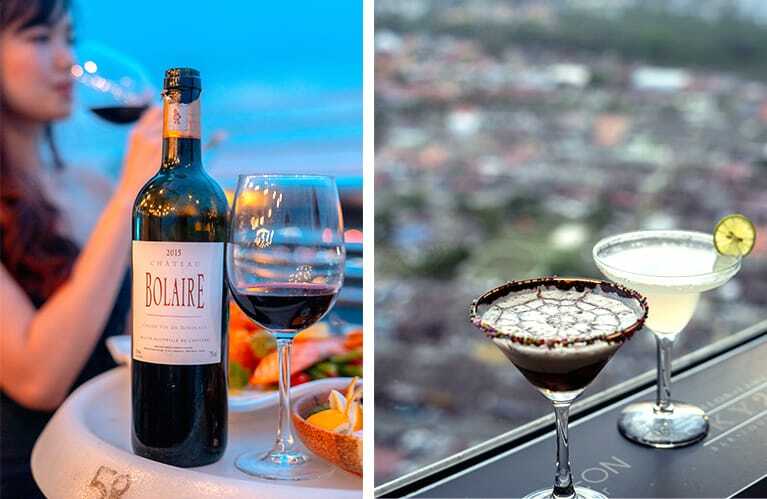 If you are more of a spirits kind of person, SKY 26 also has a cocktail named after itself; the signature SKY 26 cocktail is a chocolate martini rimmed with chocolate and sprinkles for a sweet tipple. 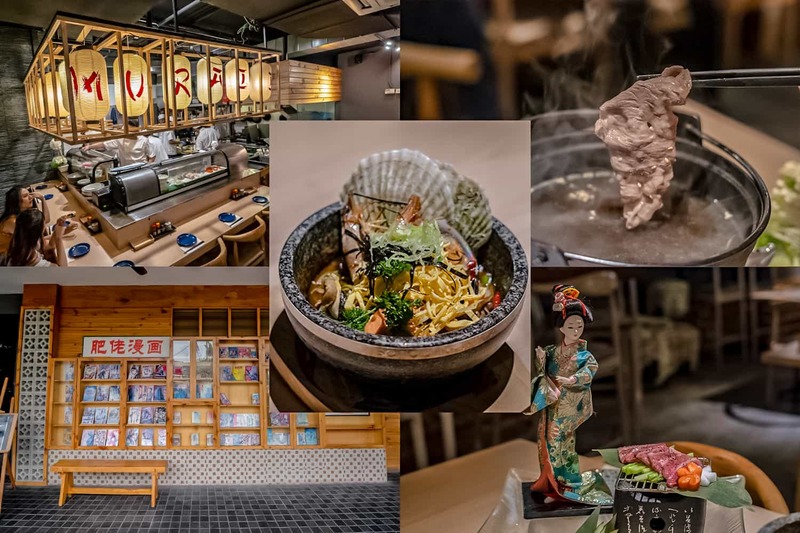 While SKY 26 has a food menu, most of the food is actually made in the same kitchen as Muraii, a Japanese restaurant on the ground floor. 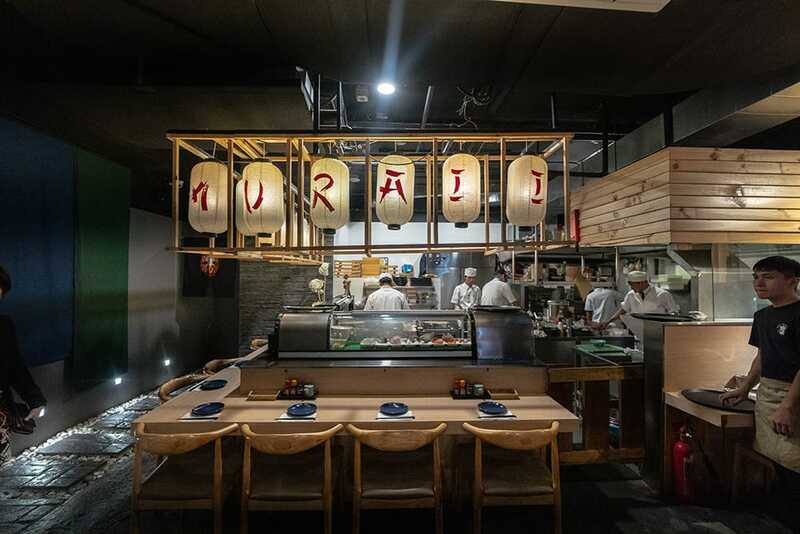 Muraii is more casual, designed to look like those hole-in-the-wall Japanese izakayas when you step in. 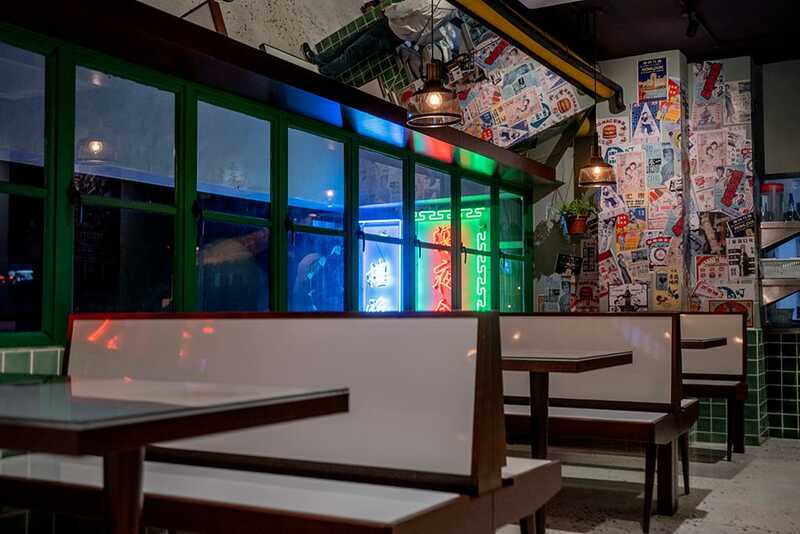 From the outside, Muraii might look like a Hong Kong restaurant as the entrance is next to a bookshelf with nostalgic ’80s comics. But once you step inside, the cosy tables and hanging lanterns bring you to Japan. There’s even a bar counter where you watch the chef prepare your dishes right in front of you. And you’d want to drop by Muraii soon to catch the comic store front before it gets revamped into a Yakimono stall. Be prepared for an exquisite gastronomical journey as the chef puts his own spin on Japanese classics, inspired by local flavours and produce. When the Furutsu Rainbow Dragon Roll first arrived on the table, the sushi roll looked like a mix between a dessert and a fruit salad. 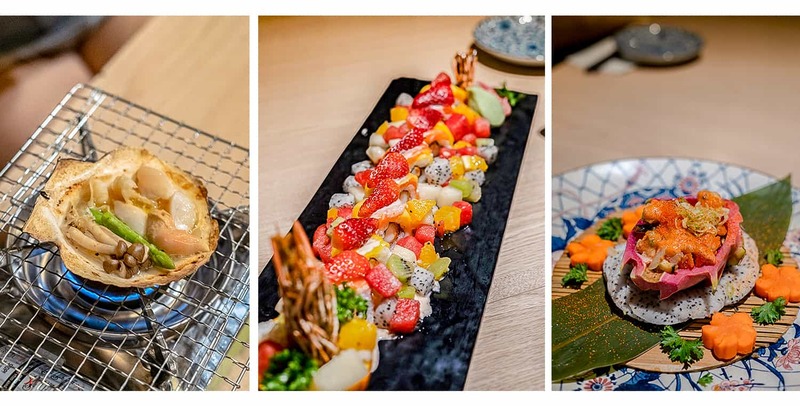 The fried ebi roll is covered in colorful tropical fruits like kiwi, mango, and orange, and drizzled in a sweet yoghurt sauce – a harmony of sweet and savoury all in one bite as all the flavours complement each other in your mouth. Somehow, all the ingredients just works together and it just made me want to put piece after piece in my mouth just to taste the myriad of flavours again. 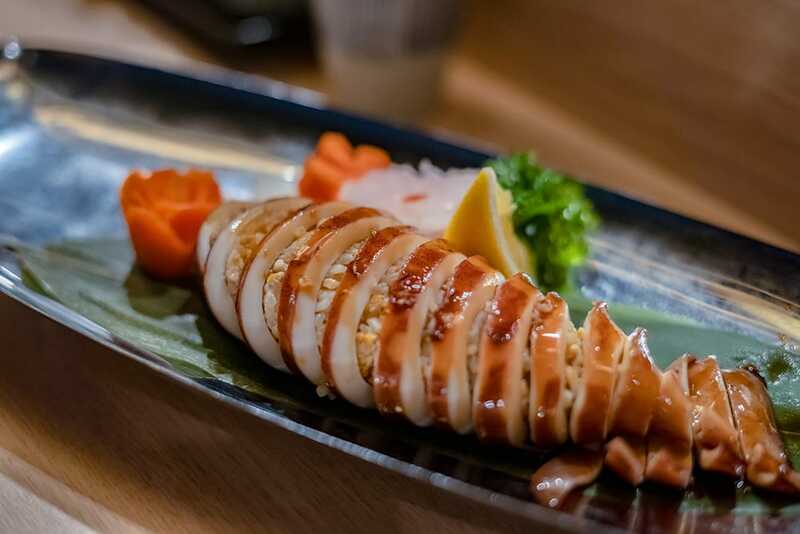 Other must-trys include the Ika Meshi, an entire Hokkaido grilled squid covered in teriyaki sauce and stuffed with garlic fried rice, and the Kaisen Dragon Fruit With Mentai, a spicy mentai salad with cod fish roes and salmon served in a dragon fruit. I like how the chef takes extra care in the presentation of the dishes down to every carrot flower detail, so much that taking the first bite almost felt like I was destroying a work of art. The ultimate indulgence is the Stone Grilled Wagyu Beef, A5 grade Japanese wagyu beef that melts in your mouth. Grill the beef on both sides for a few seconds on the stone grill, where the delicious sounds of the sizzle and the smell of cooking beef is enough to cause salivation, before putting the slice of heaven in your mouth. That’s what 200RM tastes like, but it’s worth every cent. The beef is best eaten with the side of garlic chips for a burst of umami. Sky 26. 26th Floor, Menara Malpakat, 260 Jalan Dato Sulaiman, Taman Abad, 80250 Johor, Malaysia. Open from 6pm to 1am on Mon to Thurs, and from 6pm to 2am on Fri to Sun. Muraii. Shop 9, Ground Floor, Menara Malpakat, 260 Jalan Dato Sulaiman, Taman Abad, 80250 Johor, Malaysia. Open daily from 12pm to 3.30pm and 5.30pm to 11pm. Why would you call room service when you have this Hong Kong-esque supper spot? 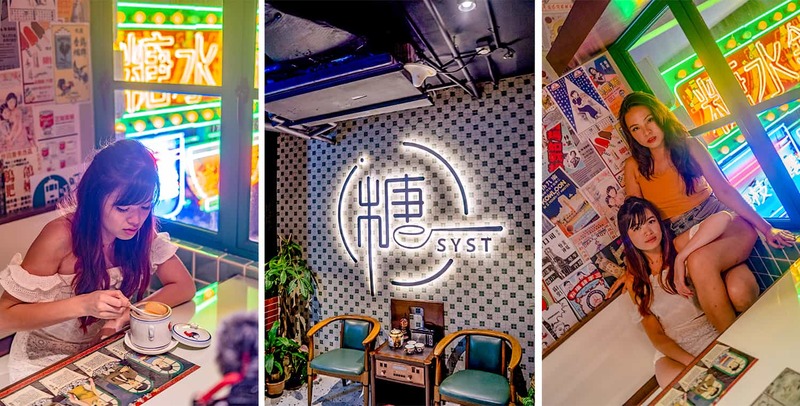 The bright neon lights and signs at 深夜食糖 SYST make us feel like we’re actually in a Hong Kong bing sutt, down to the stools and glass-topped tables with the menu staring up at you from under the glass. A zinc wall covered in old flyers above the toilet sink behind the beaded curtains makes even a simple bathroom stop an Insta-worthy journey. 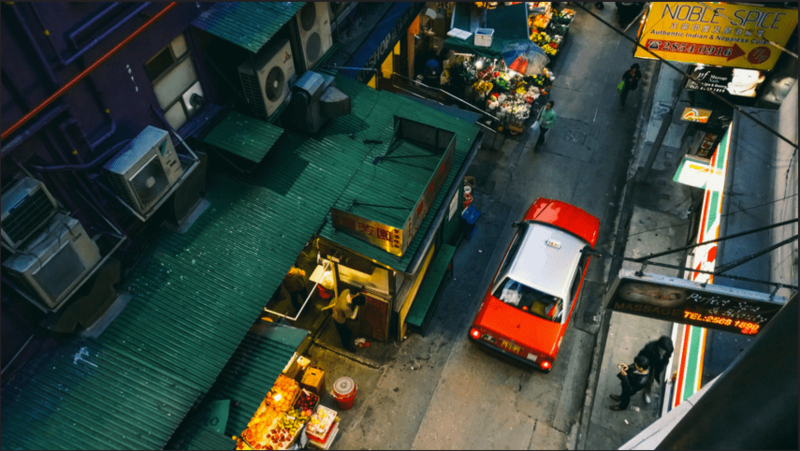 Buttery egg tarts and cold sagos await as you step into 80s Hong Kong. The menu is very traditional, with both hot and cold desserts. You can’t go wrong with a cold bowl of quintessential Mango Pomelo Sago, or be a little basic by trying the Avocado Sago, a creamy avocado sago that actually has pieces of avocado flesh floating in it. For something warm and soothing, get the Snow Pear Soup With Peach Gum and Ginseng, which is a double-boiled soup with a variety of herbs that supposedly helps people stay youthful by boosting your immune system and energy levels. Who knew a bowl of soupy macaroni and chicken could taste so good? Humble dishes like egg sandwiches and macaroni will satisfy any late night hunger pangs that you might get since this joint closes at 2am. Once you’re done with the day’s activities, SYST is a great hangout after dinner or drinks, and it tends to get crowded after midnight. The best seats are the booths at the end, right next to the colorful signs that are just screaming to be on Instagram. Don’t forget those red shades for those #hypebeast shots. 深夜食糖 SYST. Shop 6A, First Floor, Menara Malpakat, 260 Jalan Dato Sulaiman, Taman Abad, 80250 Johor, Malaysia. Open daily from 3pm to 2am. 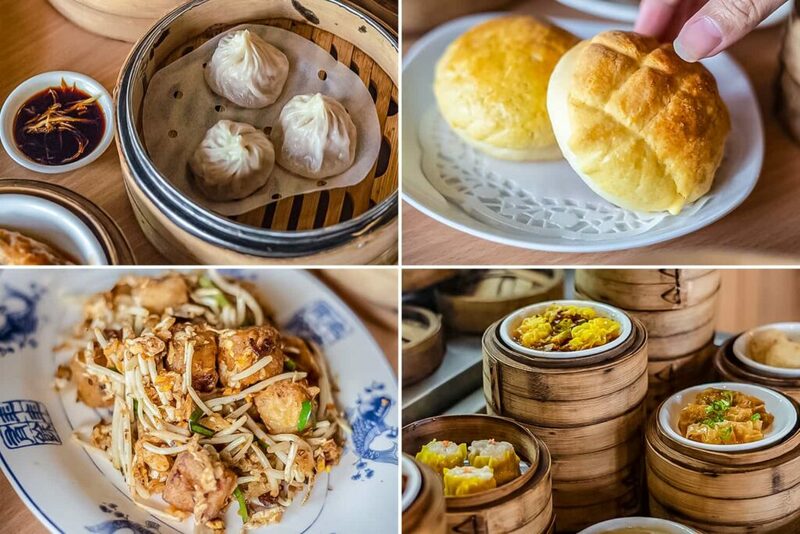 Start off your day early with a hearty dim sum breakfast. Just a short elevator ride away is Cha Lao, a Hong Kong style tea house. Literally translating to ‘tea house’, the Chinese restaurant is actually located on the second floor as the first floor is the kitchen, where you’ll see chefs preparing all the dim sum. Pick dishes off the dim sum trolley going round the room like Siew Mai, Har Gao, and Steamed Phoenix Feet With Oyster Sauce. 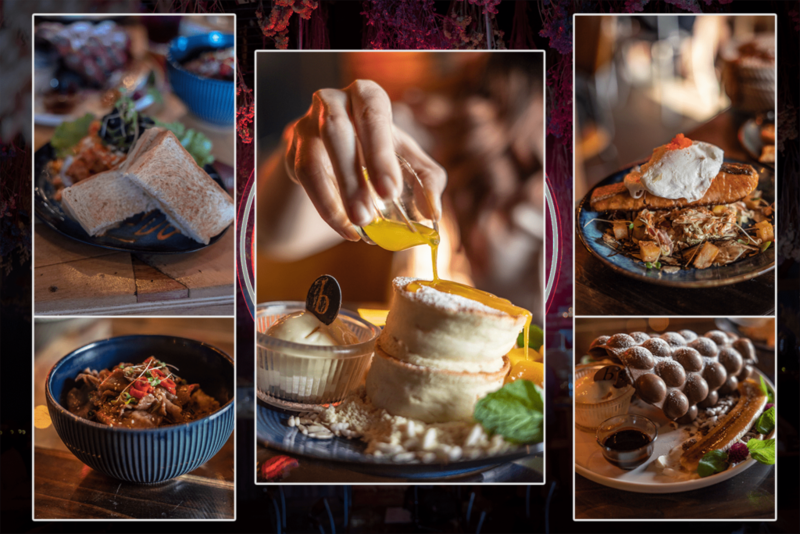 Some dishes like the Steamed Rice Rolls (Chee Cheong Fan), Steamed Bun With BBQ Pork Loin (Char Siew Bao) are made to order, and you can order it off the ala carte menu. Cha Lao has a pretty extensive selection of traditional yum cha dishes that tastes good. 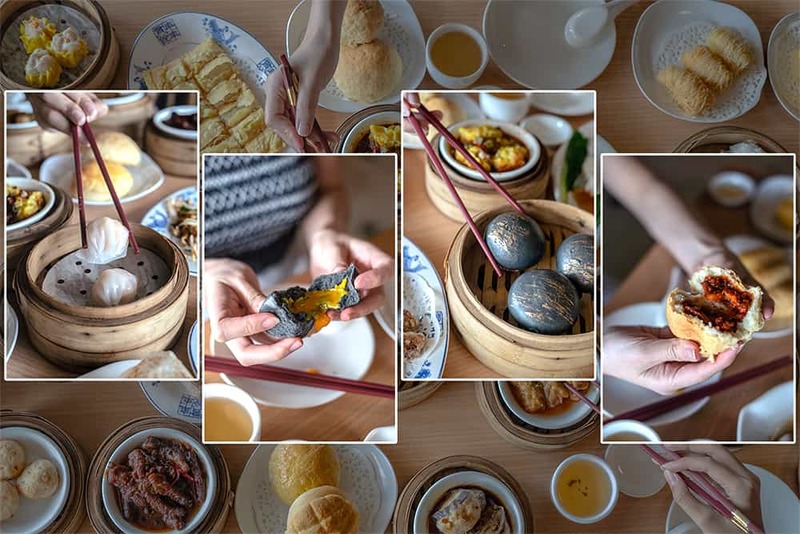 While the prices might seem a little steep compared to other dim sum places in Malaysia, the standard of the dishes more than make up for it. 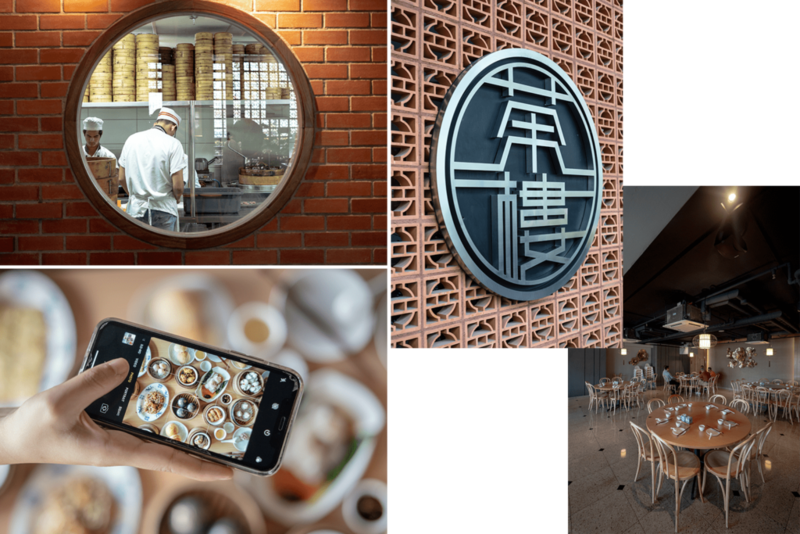 Because we all have an obsession with Instagram-worthy food, you’d want to take out your phones for the Steamed Custard Bun With Salted Egg Yolk. The black buns are glazed with edible gold glitter, and when torn apart, the insides comes flowing out in a stream of golden liquid. And it tastes as good as it looks, with the thick salted egg yolk custard soaking in the fluffy bun. Shout out to the Fried Carrot (Radish) Cake, where the radishes are extra crispy with soft insides as they are deep-fried before being stir-fried with the sauce, sprouts and chilli. You’ll find Cha Lao’s carrot cake is much lighter on the tastebuds than the savoury carrot cake in hawker centers as they don’t use as much garlic or oyster sauce. As always, end with traditional desserts like egg tarts and fried sesame balls. 茶楼 Cha Lao Dim Sum. Shop 6, Menara Malpakat, 260 Jalan Dato Sulaiman, Taman Abad, 80250 Johor, Malaysia. Open from 8am to 5pm daily. After checking out from Holiday Villa, head to Taman Mount Austin just about 10 minutes drive away. The Mount Austin area is another food enclave with even more Insta-worthy cafes and dessert shops all within walking distance. 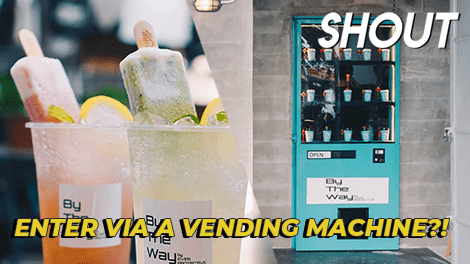 It’s our own little haven as foodies, with food trucks, chic cafes, and a plethora of bubble tea shops. 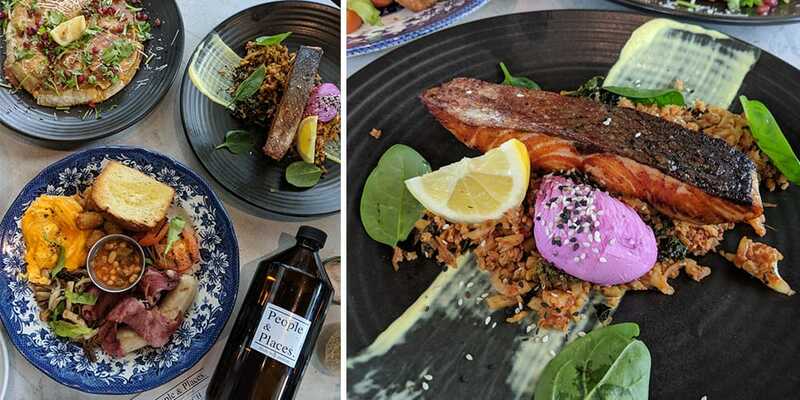 Melbourne-inspired cafe People & Places is a hipster oasis amongst all the trendy cafes. The industrial cafe has a high loft ceiling and plenty of greenery in a pleasing mix of urban architecture. 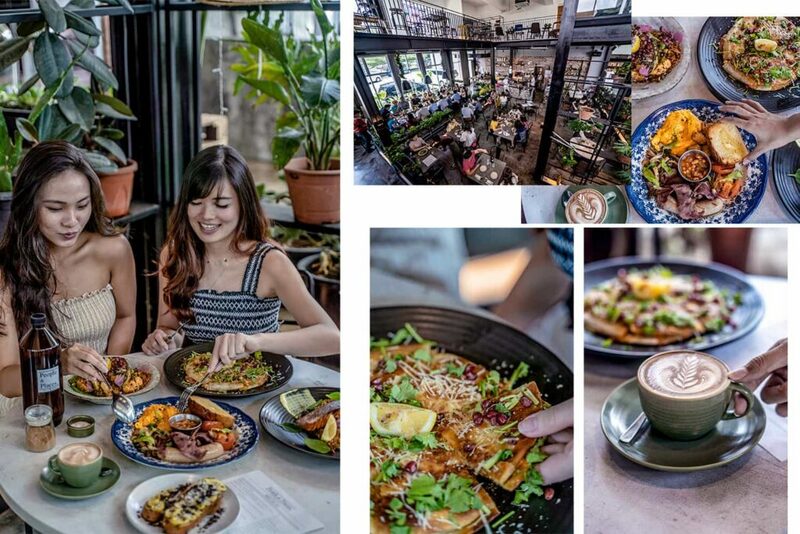 The airy cafe is flush with natural lighting and the colorful dishes makes this cafe a good stop for flatlays and OOTDs. The Quesadilla Brekkie which gained fame thanks to being the one dish that Jay Chou travelled all the way to JB for is one of the more popular dishes. The quesadilla is stuffed with tom yum scrambled eggs, sriracha aioli, coriander and cheddar cheese and is best eaten warm, so don’t take too long with your photos as the cheese and the tortilla will start to stiffen as it becomes cold. The one dish that really blew my mind was the Pan Fried Salmon With Kimchi Cauliflower Rice. The salmon was fresh and didn’t taste too fishy, and the kimchi fried rice was equal parts crunchy and spicy. The onsen egg immediately broke upon cutting it open, mixing into the rice. 10/10 would travel all the way back to People & Places just to eat this! 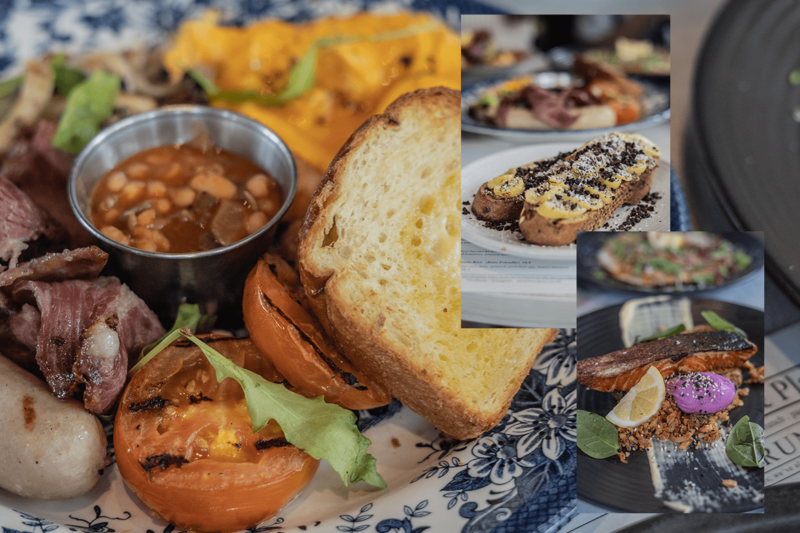 Other brunch items include the Roasted Peanut Butter Toasts and the Englishman’s breakfast. It’s not a true-blue Melbourne cafe without coffee, and the coffee selection is carefully curated with filter coffees and seasonal blends. 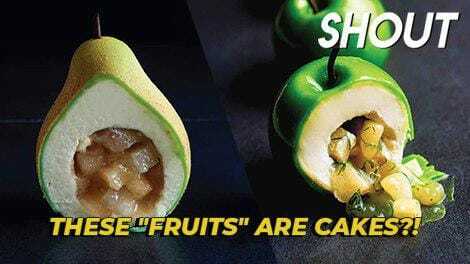 And then you have the sweet-tooths. Satisfy all your sugar cravings at The Sugar Pantry, which has cakes, pies, macarons, tarts, pastries and more cakes. 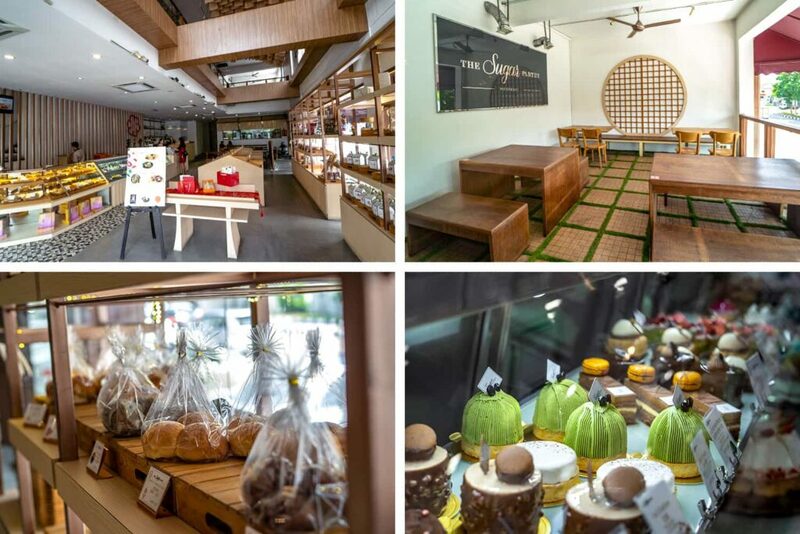 The first floor of the cafe is a bread shop where you can get freshly made pastries and desserts to go. Head to the second floor where you can chill with more intricate desserts like a macaron tower. The Berry Macaron Quee is a towering sculpture of cream, fresh strawberries and strawberry syrup sitting on top of a giant macaron. The tower also comes in a Durian flavour for fans of the pungent fruit. The Sugar Pantry also serves mains but we’re here mainly for the desserts. If you’re really keen on trying their mains since you’re there, they have an interesting Chicken Laksa Pesto worth a try. Enough of food for now? 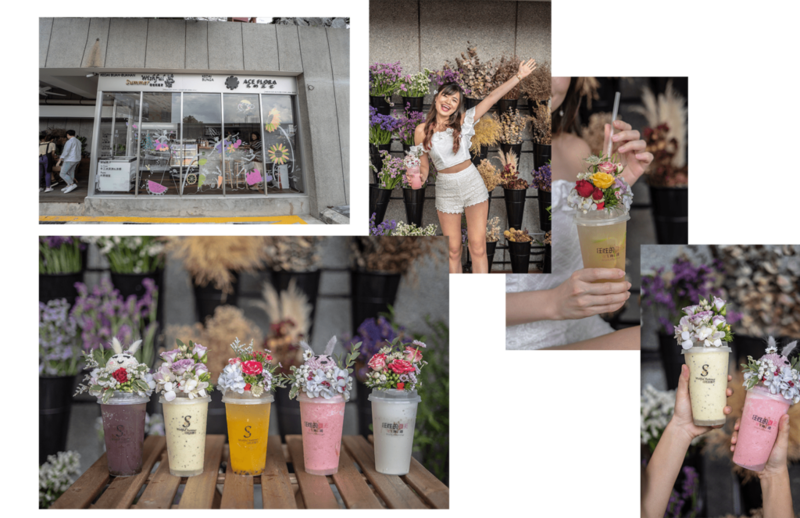 Mount Austin has no shortage of juice bars and milk tea shops. Drop by JUGOS如果。是 for refreshing juices to detox from all the eating you’ve been doing. While the store might look really small, the inside of the shop actually has a huge seating area with – you guessed it – more IG-worthy spots. You can choose between blending different fruits together or mixing it with milk, both of which will result in colorful ombre drinks ready to be Instagrammed. If you’re enjoying your juices at the store, you can even request for your juice to be served in these glass bottles with sake cups. Unfortunately you can’t bring the bottles home as they are purely for photo-taking! If you’re unsure of which fruits will go well together, you can always ask the waiters behind the counter for recommendations. Our favourites are the Honeydew Milk and the Orange Mango juice. People & Places Cafe. 6 Jalan Kencana Emas 2/3, Kawasan Perindustrian Tebrau 3, 81100 Johor, Malaysia. Open from 10am to 6pm on Mon to Thurs, and from 10am to 9pm on Fri to Sun. The Sugar Pantry. 47 Jalan Molek 1/9, Taman Molek, 81100 Johor, Malaysia. Open daily from 10am to 10pm. JUGOS 如果。是. 45 Jalan Austin Heights 3, Taman Mount Austin, 81100 Johor, Malaysia. It’s been a long day of cafe-hopping and it’s now time to wrap up your 48-hour eating marathon. Make a final pit stop at Bloom for a little escape from the dreary streets or eat all the ramen you can at a food truck because it’s that cheap. 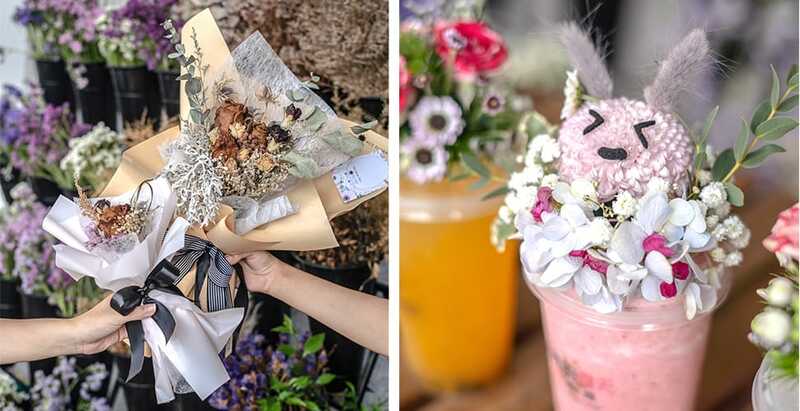 By the same founders of Mok Mok, Bloom is the whimsical sister of said minimalistic cafe in Taman Pelangi. Stepping into Bloom is like entering a magical floral garden, with dried flowers hanging from the ceiling, awash in shades of pink and purple. Swinging tables and garden chairs add to the garden vibes without you having to swelter in the outside heat. The cosy cafe can seat at most 25 to 30 people, so be prepared to queue on weekends. The menu is mostly similar to Mok Mok’s, with interesting Japanese fusion dishes, desserts, and even the flower teas. 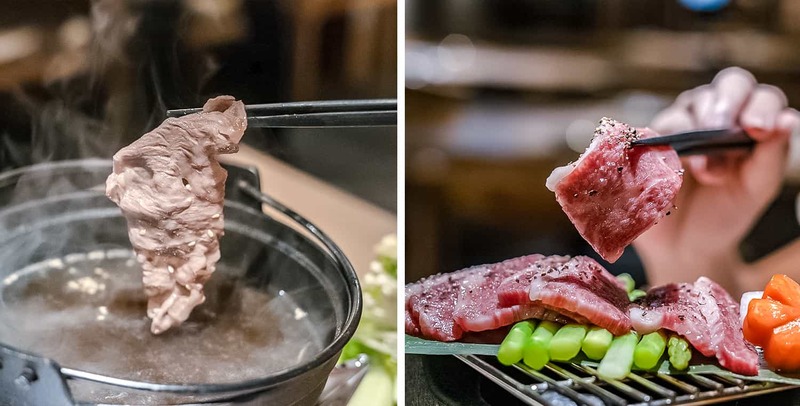 Tuck into their signature don, Gyutan, where thin slices of beef tongue is marinated in chili sesame oil and shoyu. 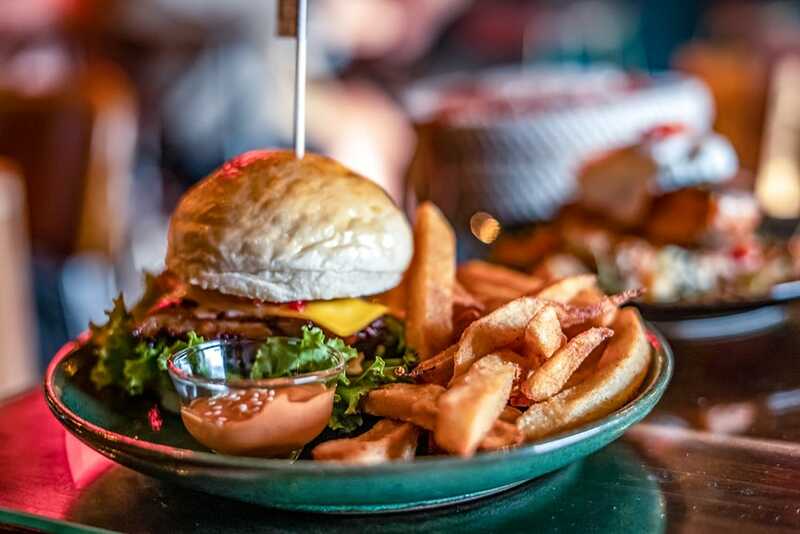 It’s a bit on the spicy side, so those who don’t like spice can go for Western delights like the Salmon Sunrise or the Grilled Chicken Burger. If you love onions, opt change your side of fries to the Onion Fries, which are strips of airy deep-fried onion. Too full from all the eating? 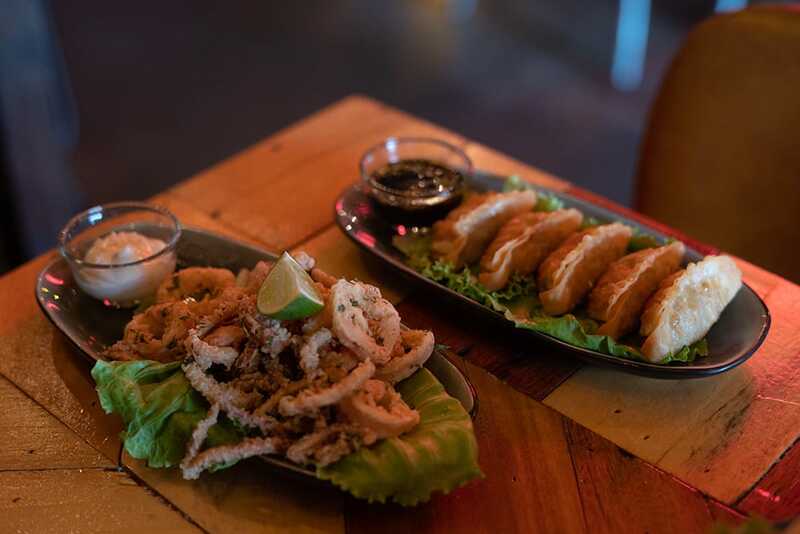 Have some bites like the fried Calamari and Gyozas, but do leave some space for dessert. You do not want to miss the Fresh Mango Souffle Pancake, a moist, jiggly cream cheese souffle pancake. Served with sweet mangos and vanilla ice cream, each bite of this Japanese dessert is soft and fluffy that’ll leave you spooning more and more into your mouth. Before you know it, it’s all gone! Dining in food trucks is part novelty and part budget. 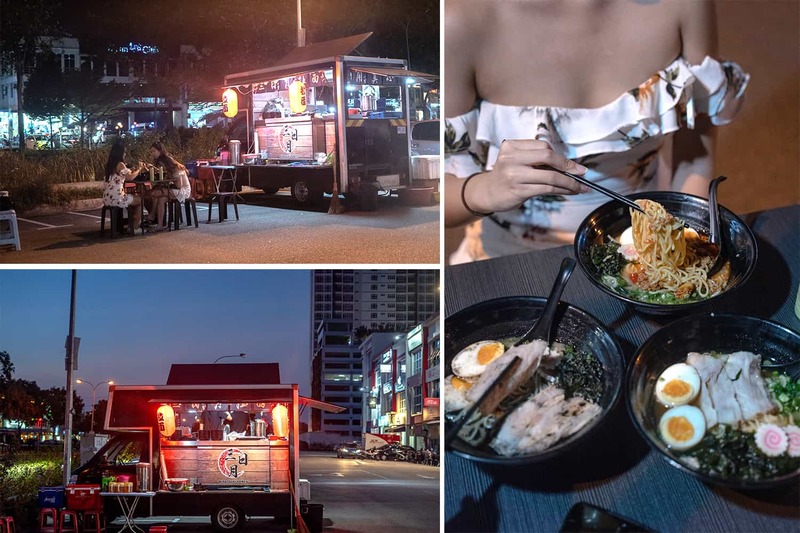 三日月拉麵 is a food truck that sells really, really cheap ramen out of the carpark lot. This was my first time eating at a food truck in the middle of a carpark and it was actually pretty enjoyable. It’s hard to really find fault; each bowl of ramen is only 14 – 15RM (SG$4.50- $5), your order is served in a couple of minutes, and they also sell this really good homemade green milk tea that matcha lovers will go crazy for. Choose from 4 different broths: tonkotsu, shoyu, spicy tonkotsu, and black garlic, and each bowl comes with two slices of cha shu, spiral fishcake and an onsen egg. It’s hard to say which is the best between the spicy tonkotsu and black garlic broths. The spicy tonkotsu ramen gets a fiery kick from the chilli minced meat that is added to the soup, while the black garlic broth is sweeter and heavier with intense garlic flavours. Add on some sides like takoyaki, gyoza, and karaage to complete the true Japanese meal experience. Many families and office stop workers regularly stop by the ramen food truck for a quick dinner, so you don’t usually have to wait long. Once you’re filled up with ramen, head over to the 7-Eleven that the food truck just parked in front, where you can stock up on tons of interesting snacks like the Ghost Pepper Instant Noodles for the trip back to Singapore. Bloom. 87 Jalan Mutiara Emas 2A, Taman Mount Austin, 81100 Johor, Malaysia. Open daily from 12 noon to 11.30pm. 三日月拉麵. Carpark lot in Jalan Mutiara Emas 2A, Taman Mount Austrin, 81100 Johor, Malaysia. 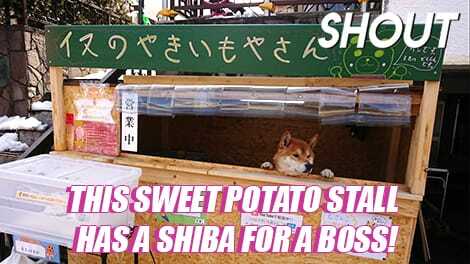 Usually found in front of 7-Eleven. Open daily from 6.30pm – 12.30am.